The position of the President in the scheme of our Constitution is one of the highest honour, dignity and prestige. He is the head of the State. All executive power of the Union is vested in him and all executive action of the Government of India is taken in his name. The Supreme Command of the Armed Forces, with authority to declare war and peace, is vested in him. The President appoints the prime minister. 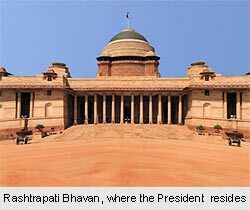 All the high functionaries of the State, including judges of the Supreme Court and high courts, the attorney general of India, the Comptroller and Auditor General of India, the governors, ambassadors, etc, are appointed by the President. The President is an integral part of Parliament. He summons the two Houses to meet, prorogues their sittings, and may dissolve the Lok Sabha. He addresses a joint meeting of both Houses at the beginning of the first session each year and after each general election. The President may also, otherwise, send messages to both Houses or address either or both. All Bills, after being passed by Parliament, must receive the assent of the President in order to become laws. Bills belonging to certain categories (for example, money bills) can be introduced and proceeded with only with the President's recommendation. He summons the joint sitting of both Houses in case of any disagreement between them on a Bill. When Parliament is not in session and the President is satisfied about the need for immediate action, he can promulgate ordinances that have the same force and effect as laws passed by Parliament. The President has the power to grant pardons, reprieves, respites or remissions of punishment or to suspend, remit or commute the sentence of any person in all cases where the punishment has been awarded by a court martial, is for an offence against a Union law or is a sentence of death. The President may proclaim a state of Emergency in the whole or part of India if he is satisfied that a grave situation exists whereby the security of India or part of its territory is threatened by war, external aggression, or armed rebellion. In case the constitutional machinery fails in any state, the President may impose, by proclamation, President's Rule in that state. Article 360 of the Constitution empowers the President to declare a financial emergency. The President represents the nation but does not rule it. The executive power of the Union has to be exercised by the President 'in accordance with the Constitution' and the exercise of powers over the armed forces has to be 'regulated by law.' The President takes an oath 'to preserve, protect and defend the Constitution and the law.' Article 74(1) requires the President to act only with the aid and advice of the council of ministers in the discharge of all his functions. After appointing the prime minister, the President appoints other ministers on his advice. The council of ministers so constituted is collectively responsible to the House of the People (and not to the President) and, as long as it commands the confidence of the House, is not subject to dismissal by the President. But individual ministers hold office during the pleasure of the President, which means they can be dismissed on the advice of the prime minister on whose advice they were appointed. While the President is the constitutional head of State, the Council of Ministers constitute the real or the political executive. Technically, they are his government, his ministers on whose advice he has to act. In other words, in constitutional theory, all powers are vested in the President-in-the-council-of-ministers, that is, the President acting on the advice of the council of ministers. In actual practice, however, the President himself becomes an advisor to his ministers. The President can exert substantial influence in many ways. While there should never be any occasion of his speaking to the media or in public against the policies or acts of his own ministers, he has every right 'to encourage, caution and warn' his council of ministers where necessary. He has an unfettered right to be informed and to seek information. The prime minister and other ministers are, by convention, expected to see him regularly. The prime minister is specifically required to keep him informed. The Constitution envisages a fully cooperative and harmonious relationship between the President and his Council of Ministers. That is why it also lays down that 'the question whether any, and if so what advice was tendered by the ministers to the President is confidential between them and cannot be enquired into in any court of law.' It is a very salutary provision and is based on the principle that the President and his ministers are never to be perceived as separate centres of power. The centre of power is one, and that is the President-in-the-council-of-ministers. Under the proviso to Article 74, inserted in 1978 by the 44th Amendment, the President may require his council of ministers to reconsider their advice. He shall, of course, act on the reconsidered advice. But, ideally, all this should also remain confidential between the President and the ministers and not leaked to the media. There are some grey areas where the President may still have to use his own judgement and wisdom, for example, in the appointment of the prime minister, the dissolution of the Lok Sabha on the advice of a council of ministers against whom a vote of no-confidence may have been passed, and in dealing with a council of ministers that has lost the confidence of the House but refuses to resign. If a party or a pre-election alliance commands an absolute majority in the Lok Sabha, there is no difficulty in the appointment of the prime minister. But, where no single party or coalition is in a position to form a government on its own, the President's role in choosing the prime minister becomes most delicate and difficult. To get over some of these difficulties and keep the Presidency above all politically controversial matters, the National Commission to Review the Working of the Constitution has suggested the election of the prime minister by the Lok Sabha and his removal only by a Constructive Vote of No Confidence by the House. The writer, a former secretary general of the Lok Sabha, was a member of the National Commission to Review the Working of the Constitution and chairman of its drafting and editorial committee.